Rigid origami is a unique subset of origami, where continuous folding motions are generated by its facets rotating around creases without being stretched or bended. This key feature has led to a great potential in engineering applications, such as foldable structures that consist of rigid materials. Kinematic behaviors of rigid origami can be analyzed and modelled by utilizing the kinematics of spherical linkages, where the crease pattern can be considered as a network of spherical linkages. A series of new planar and tubular rigid origami patterns were discovered by solving the highly nonlinear inverse kinematics of 2D and 3D spherical linkage networks. For example, new types of 1-DOF rigid foldable tubular structures were constructed by either employing additional facets onto each modular unit or combining two 1-DOF tubes to a new configuration. These methods were appliedto not only multilayered vertical tubes, but also radially assembled arc form profiles. Furthermore, the mechanical properties of rigid foldable tubular arches were investigated both experimentally and numerically. A geometric description was then developed, which could be applied to various types of origami-inspired tubular structures. These research findings provided design possibilities for a range of engineering applications such as deployable structures, metamaterials, and origami robotics. 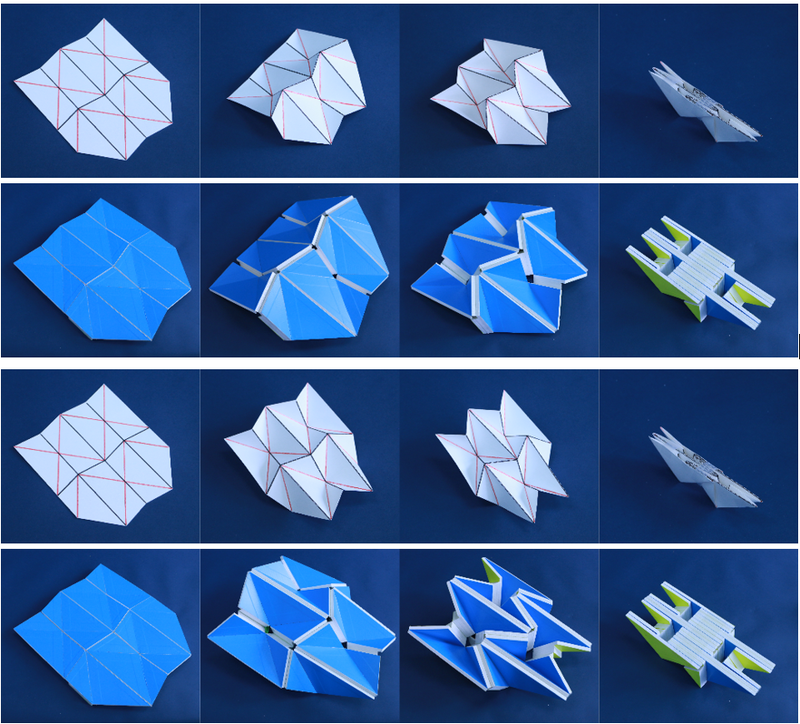 In order to apply rigid origami to engineering applications, we considered the thickness of rigid materials, and developed a comprehensive kinematic synthesis for rigid origami of thick panels. 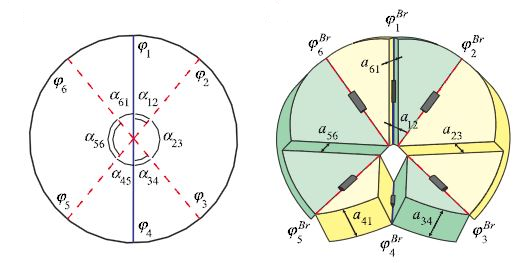 It was realized by considering the crease pattern as a network of spatial overconstrained linkages instead of traditionally used network of spherical linkages. 1-DOF thick panel origami were hence determined by analyzing its inverse kinematics and compatibility of spatial linkage assemblies, geometric conditions, and motion sequences. In addition, the proposed method was capable of reducing DOF for zero-thickness origami to 1-DOF in their corresponding thick-panel form, which greatly simplified the actuation system. Our work resolved the major problem that prevented engineering applications of origami-inspired structures. The research outcomes were published in Science in 2015, as the first mechanism related article published in this top research journal. The theory of thick panel origami was also used to investigate symmetric folding of a six-crease based waterbomb origami pattern. By analysing its networks of spherical 6R linkages and spatial overconstrained linkages of its zero-thickness and thick-panel forms, respectively, it was found that the waterbomb origami pattern was able to produce two folding paths under certain circumstance. Furthermore, the 1-DOF folding motion of its thick-panel and zero-thickness forms were found to be equivalent between the flat folded and fully expanded states. Rigid-foldable origami structures with multiple states can be developed by using the theory of spatial mechanisms combined with rigid origami. We proposed a design framework for superimposed patterns, and would allow the patterns to produce independent kinematic movements. Therefore, a non-flat-foldable origami pattern can be flat folded by utilizing a flat-foldable superimposed pattern without any interactions. This enables many design possibilities for new type of origami-inspired engineering structures with multiple states, as they can be manufactured and transformed from the same rigid material. We invented an origami tent based on a 1-DOF rigid-foldable tubular geometry, which is lighter, cheaper and more environment friendly compared with traditional tent design. Our design has won the department award of earthquake reconstruction in the competition of Japan technology and business plan in 2012. Further utilizing thick-panel origami, a rigid deployable paraboloid antenna design was proposed. 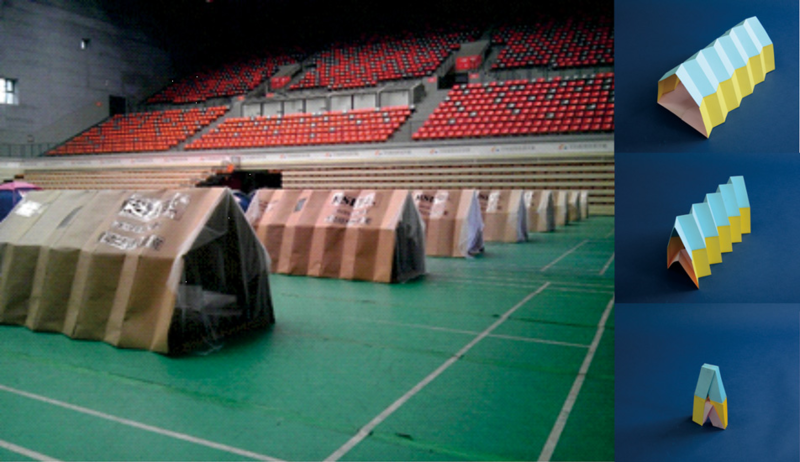 It has a large deployable over packaging ratio of 8, which is the greatest of any existing deployable antenna designs.